Parameterizations generated with ABF++ (The seams were cut with Seamster) . 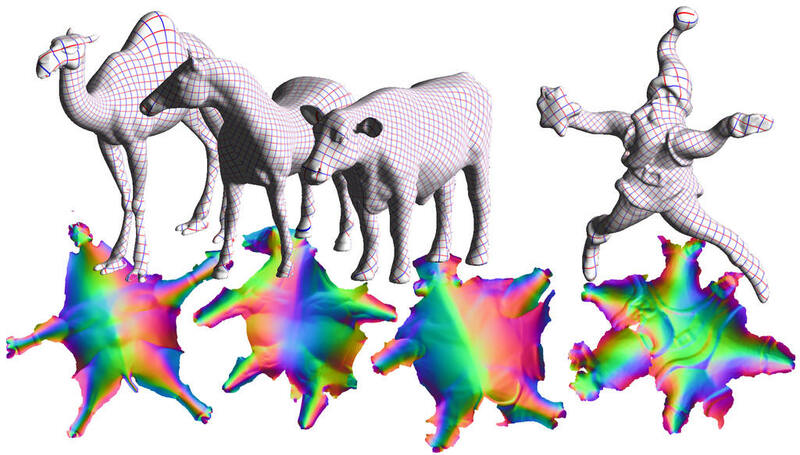 Conformal parameterization of mesh models has numerous applications in geometry processing. Conformality is desirable for remeshing, surface reconstruction, and many other mesh processing applications. Subject to the conformality requirement, those applications typically benefit from parameterizations with smaller stretch. The Angle Based Flattening (ABF) method, presented a few years ago, generates provably valid conformal parameterizations with low stretch. However it is quite time consuming and becomes error prone for large meshes due to numerical error accumulation. This work presents ABF++, a highly efficient extension of the ABF method that overcomes those drawbacks, while maintaining all the advantages of ABF. ABF++ robustly parameterizes meshes of hundreds of thousands and millions of triangles within minutes. It is based on three main components : (1) a new numerical solution technique that dramatically reduces the dimension of the linear systems solved at each iteration, speeding up the solution ; (2) a new robust scheme for reconstructing the u,v's from the angle space solution that avoids the numerical instabilities which hindered the ABF reconstruction scheme ; and (3) an efficient hierarchical solution technique. The speedup at (1) does not come at the expense of greater distortion and the resulting parameterizations remain provably valid. The hierarchical technique (3) enables parameterization of models with millions of faces in seconds, at the expense of a minor increase in parametric distortion. As a result of those extensions the ABF++ method is extremely suitable for robustly and efficiently parameterizing models for geometry processing applications.